Pay Dirt: Forward, forward, the Bingham Miners go. The first thing my wife asked me this morning was if I were ready to hit “pay dirt.” If you recall, last week, I wrote how she gives me no attention all week long, then on Tuesday mornings, she becomes what cheap romance paperbacks describe as “steamy and provocative.” I write this column every Tuesday. After years of marriage, I finally realized that there’s a connection between my rambling sentences and her 168-hour libido cycle. Who knew? She was right. 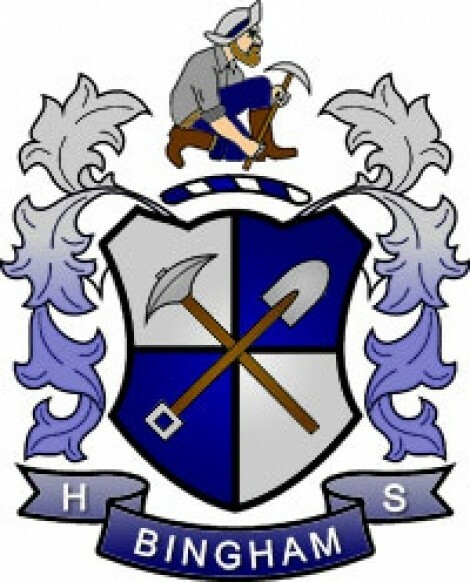 A while back, my alma mater (my “loving mother” as I learned in today’s assembly) voted me into its Pay Dirt Club—an honor society of 100 or so accomplished BHS graduates, plus me. All streaks come to an end. I headed out the door for South Jordan where the “new” Bingham High School has been located since 1975. I attended the “old” Bingham High School in Copperton. Besides great architecture and a perfect hillside location, the only thing my old high school building had over this one was the asbestos. I had two of my kids with me for moral support. We picked up my mother on the way (Stella, BHS 1946) and my younger brother Terry (BHS, 1974). At the school entrance, we hooked up with a cousin of ours (Harry Pappasideris, BHS, 1958). Harry is also in the Pay Dirt Club, but unlike me, is a deserving member. Another Pay Dirt member, Scott Crump (BHS, 1970), introduced me to the student body, along with today’s first Pay Dirt inductee, Marilyn Richards (BHS 1968). I ran into Perry Newman and Annette Gardner Egan (both BHS 1973) and Joey Sato (BHS 1974), who is now a teacher and the Bingham High School baseball coach. Dennis Nichols (BHS, 1963)—who was once awarded Best One-Armed Piano Player by City Weekly after a stroke partially disabled him—took the stage with his trusty electric piano. Dennis had a long career as a musician and music instructor, and he never let his disability slow him down—if there was a person in the building today who exemplified what it means to be a Bingham Miner, it was Dennis. He is by no means a quitter. He really does still play with one hand, while also using a tape to play the second part and to add background sounds. For his performance, he took Bingham’s fight song and played it in a variety of styles, from 1789 French baroque to Bourbon Street jazz to modern-day London pop. For his finale, he invited the Bingham High School cheerleaders onstage to lead us all in the rousing, pep-rally song that has been a part of my own psyche since first hearing it when I was about 5 years old. It will perform better this Friday when Bingham beats Riverton. Bingham has a great fight song. It’s so great that when I was in school, many students took it quite literally—fist-fighting after high school athletics was as common as a denominator. I’ve seen some great fighters: Bobby DeLuca. Jim Beckstead. Dave Weichman. I remember buses getting tipped over like cows in the middle of a starless night. The school has such a great fight song that once peace was struck (usually with a pipe, for those of you who recall that era), we learned that even kids from other schools could sing it. We had such a great fight song that, one night in Tooele, despite having been beaten on the football field, Dean Edmunds (BHS 1971) decided to take on the entire Tooele Buffaloes football team. On the way to our lockers, he started singing that Roger Miller classic “You Can’t Roller Skate in a Buffalo Herd.” The Tooele players took umbrage and before you know it, they were getting the snot kicked out of them. I had some guy against the fence and was doing just fine. That didn’t stop Junior Montoya (BHS 1972) from taking off his helmet and whacking the poor fellow. One of our coaches came along and gave him a couple pops, too. For good measure, Phillip Lopez (BHS 1971) was giving the boot to the Tooele cheerleaders. On the bus home, our captain, Randy Johnson (BHS 1971), declared victory. Our coaches thought otherwise after discovering our halfback had arrived at the Tooele sideline at halftime. Legend has it he’d gone to Wendover and back. That our teammate (my buddy Kevin Hamilton, BHS 1972) reeked of a mysterious liquid substance and was missing a front tooth from his own parking-lot scrape was icing on the cake—most of the team was expelled for the season. But, we couldn’t play with just eight or 10 guys, so everyone was back on the team in a day or so. The lesson? There isn’t one, except that 37 years is a long time. Things change. Times change. People change. Bingham High School has changed. My hope is that the students have not, but that they will fight smarter than we did and that they never give up. It’s the 100-year-old Bingham Miner way: Onward, onward, team against the foe. Forward, forward the Bingham Miners go. Bingham, we are with you, and we’re here to cheer you. Fight, fight, fight, for victory! Or pay dirt. Of any kind. On any day. Hopefully, there’ll be no assemblies next Tuesday.